Councilwoman Tiffanie Fisher: "REMINDER / Please Join - Tonight (5/30) /Tomorrow(5/31) & Next Week (6/6)"
Both nights are the same presentation so please try plan to join one. I will be there tonight for the entire meeting, and then tomorrow night for most (there are competing events that night). During this phase of work, the Resist components (flood control structures to resist storm surge) will be designed. This is when YOU get to help design areas and structures like the park around Weehawken Cove. WE NEED TO MAKE THIS WORK FOR US and more voices matter! So hope to see you at least one! As always, please feel free to email me or call me at 201/208-1674 if you have any questions or comments or want to discuss this or anything else. The HudCo insurrection to grab the county prize is looking less than favorable for HudCo political powerhouse State Senator and Union City Mayor Brian Stack. Stack's civil war insurrection joined by mayors Steve Fulop and Ravi Bhalla vying to take control of the political levers of Hudson County Democratic Chair in next month's election is a prequel to snatching the County Executive position outright next year. after Hurricane Sandy. He's not happy with his fellow HudCo civil war insurrectionists: Hudco allies Mayor Steve Fulop of Jersey City and Hoboken Mayor Ravi Bhalla. 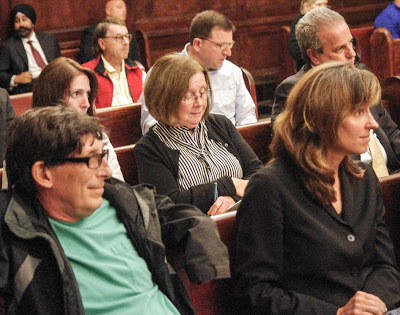 MSV can report those committee vote collection efforts for Stack around the county and in the Mile Square City by Hoboken Mayor Ravi Bhalla are fizzling, leading many observers to believe there's an upset in the making with upstart candidate Amy DeGise, the daughter of the 18 years long HudCo County Executive Tom DeGise. Hoboken, already raked with regular double-digit county tax increases courtesy of the massive spending and patronage appetite of HudCo Democrat Progressive rule is likely to come out a big loser, courtesy of its politically ambitious mayor. 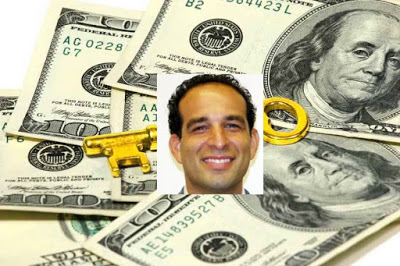 "Stack is flipping out and screaming at Fulop about the (Jersey City committee) count and Ravi Bhalla is hiding not taking his calls," one HudCo insider relayed. 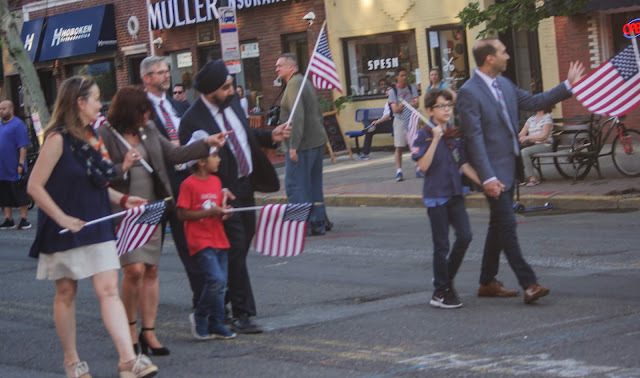 Bhalla who saw a political path out of Hoboken through Senator Stack via an Assembly seat currently held by Annette Chaparro may see that door slammed if Amy DeGise pulls off the upset victory. 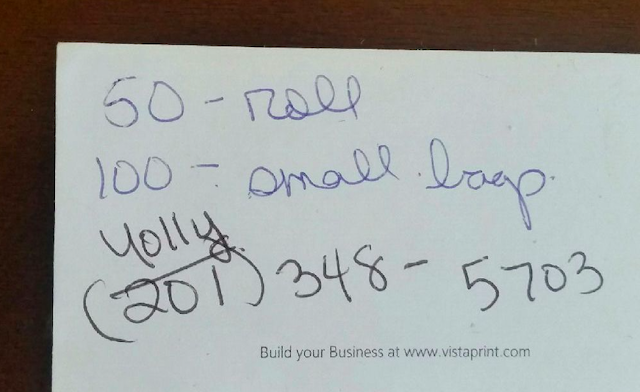 The inside word among HudCo is Ravi Bhalla promised to deliver Stack 60 of almost 80 Hoboken Democratic Committee votes. Based on unofficial headcounts, it doesn't look like he'll deliver anything close. Panicked calls around Hoboken are taking place right down to the committee district level in the third ward. 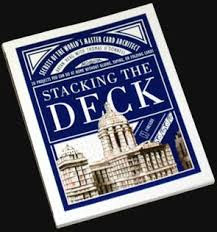 "If Stack goes down in flames, Ravi can forget any hope of being handed the (Stack) Assembly seat next year," another HudCo source said. 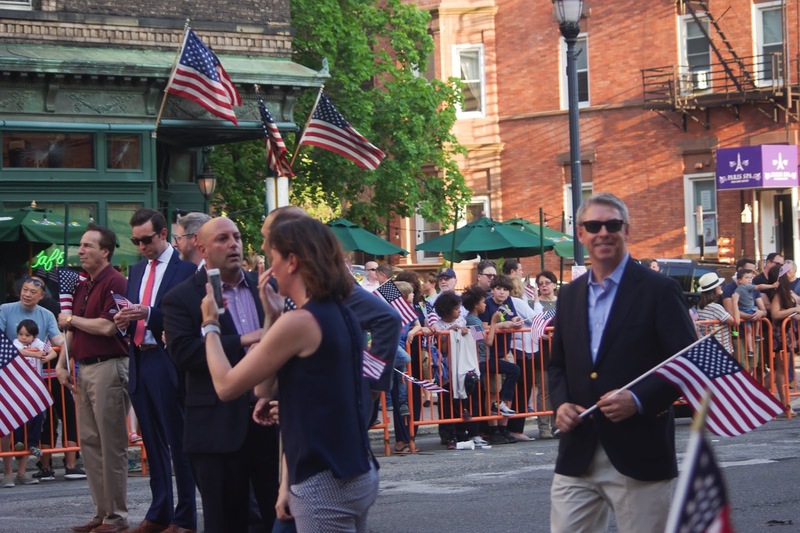 "Stack expected Ravi and Fulop to deliver and neither appears to be making good on those needed committee votes," another HudCo insider relayed. "If he loses, Brian will be looking to rip people's lungs out. Fulop and Ravi will be high on the list. Flip a coin who gets it first," they added. Another longtime HudCo maven mocked their ineptitude leading into the HudCo Democratic Chair vote next month, "They (Fulop & Bhalla) don't know what they're doing. There's no adult in the room and (Amy) DeGise is working hard. She's almost positioned for a victory." Of the predicament that places Ravi Bhalla and Hoboken, they added, "Ravi is another Hudson County transactional politician in a ..."
The rest of this story is MSV Premium content and will be released to subscribers later today. Related: Another report following MSV today quotes NJ Governor Phil Murphy saying he will not back Brian Stack for HudCo Democratic Chair. He's staying out of the HudCo civil war. An MSV reader submitted this photo from Barnegat on Rt. 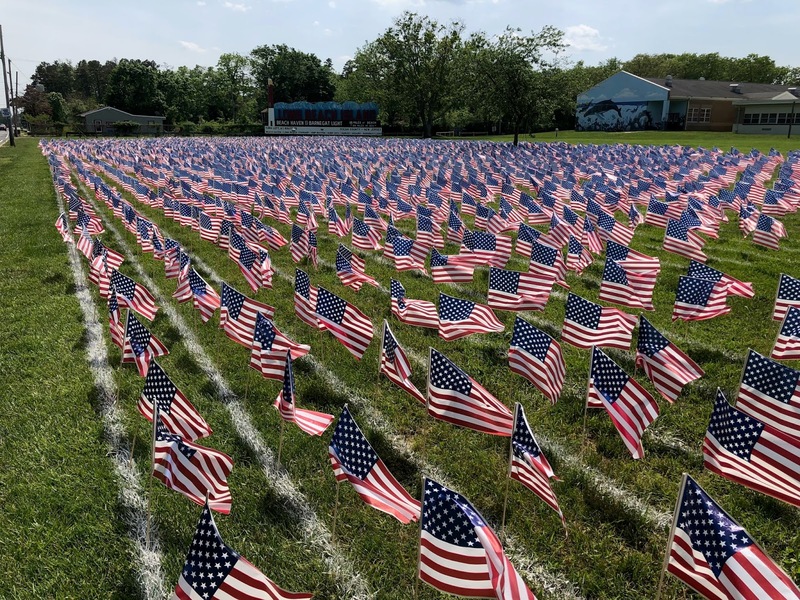 9 showing a sea of American flags honoring those who made the ultimate sacrifice. They sacrificed their lives for this Republic, this Constitution that the promise of freedom would not perish but thrive for future generations. Another MSV reader sent this video of a Navy SEAL honoring all those who fought and died highlighting its origins from Lexington & Concorde to the Forgotten War and every conflict before and since. 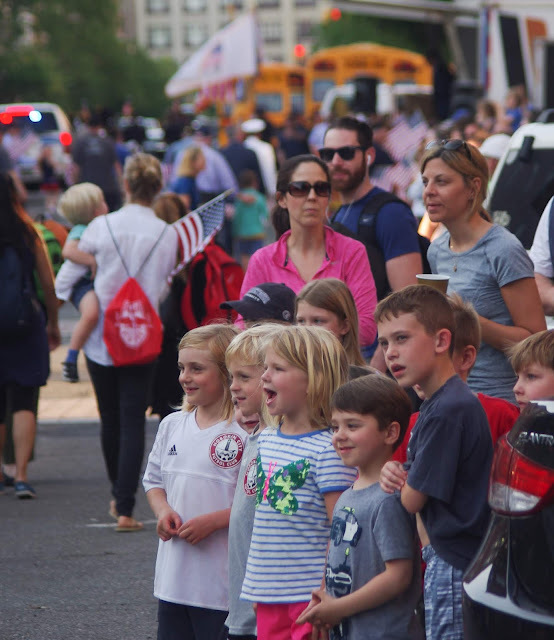 Claimed as the longest running event of its kind in America, yesterday's perfect weather saw an outstanding turnout for Hoboken's 120th annual Memorial Day Parade. America's fallen were honored by all the participants. MSV attended capturing the sign of the times. 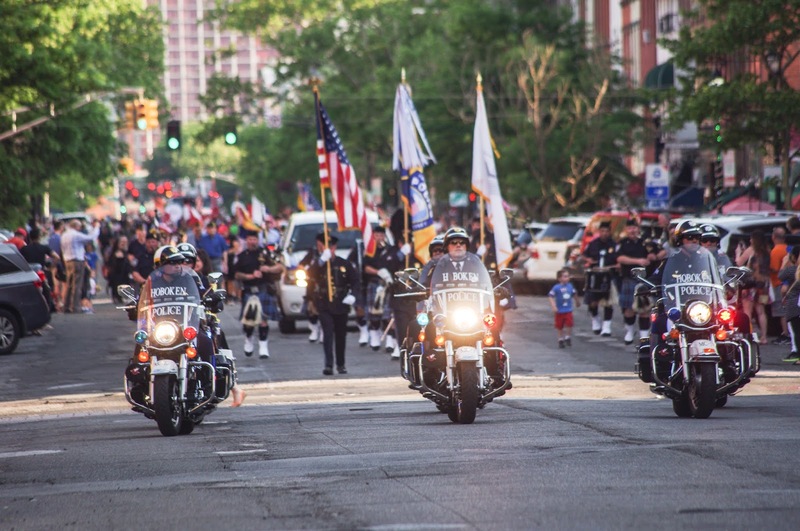 Hoboken's Finest kick off the event as police on motorcycles lead the way honoring America's fallen. Hoboken Color Guard led by "the pipes." 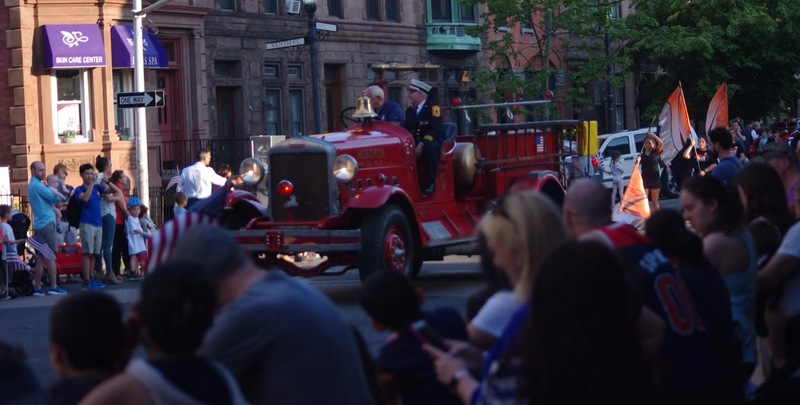 Hoboken's decked out Firemen with Battalion Chiefs on hand flashed a sharp look on the parade route. "Bagoogah!" A Hoboken fire truck circa 1930 makes its way up Washington St.
and City Council President Ruben Ramos. Soaking it in. Fifth Ward Councilman Peter Cunningham enjoys a moment as Sixth Ward Councilman Jen Giattino snaps a memento with Directors Leo Pellegrini, Steve Marks and Ryan Sharp and Freeholder Anthony "Stick" Romano (left). 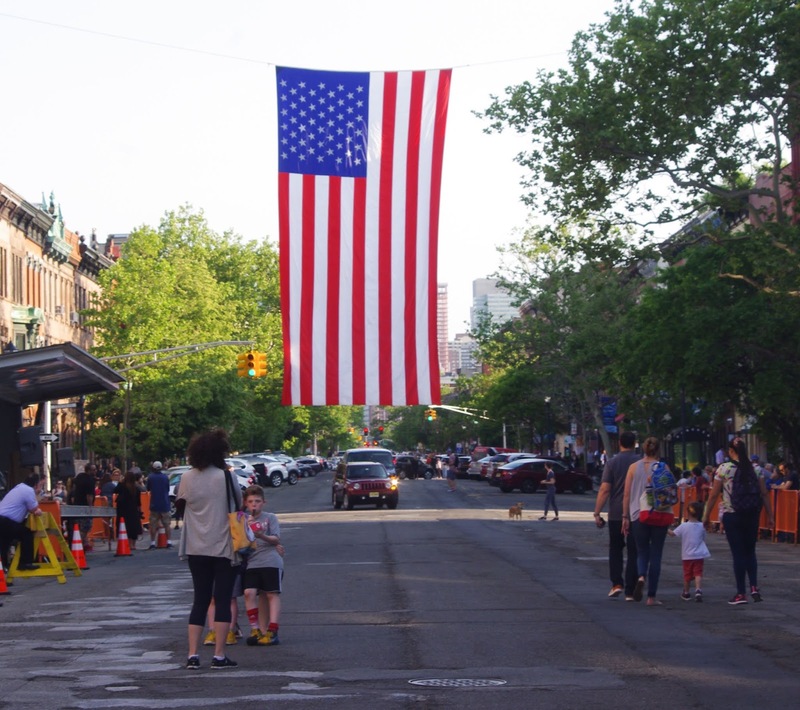 Councilwoman Tiffanie Fisher: "Tonight at 630pm 120th Hoboken Memorial Day Parade!" 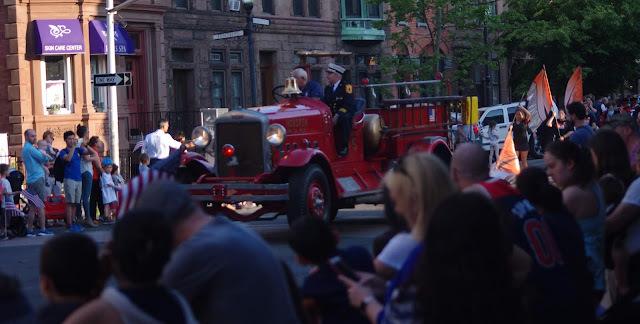 Who doesn't love a parade! Especially one that brings our community together to pay tribute to those who made the ultimate sacrifice for all of us. 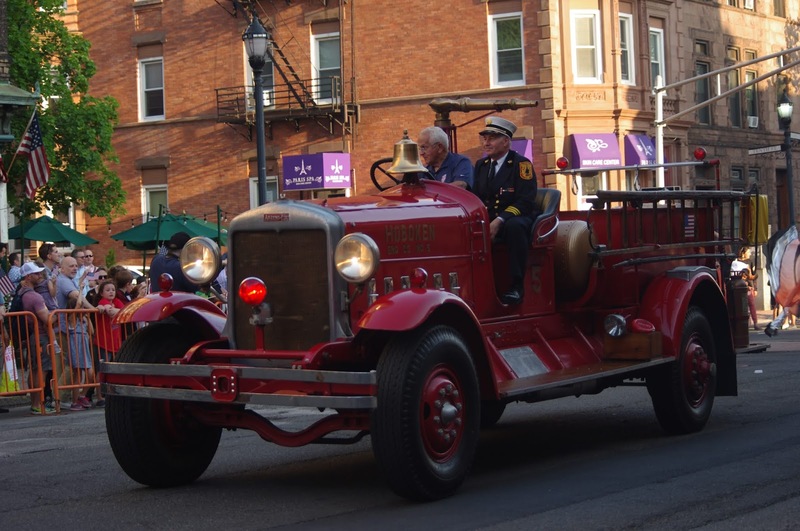 The parade is presented by our Hoboken American Legion Post 107. Click on the link to learn more about them and the amazing project they are undertaking to build six new homes for homeless veterans in Hoboken. 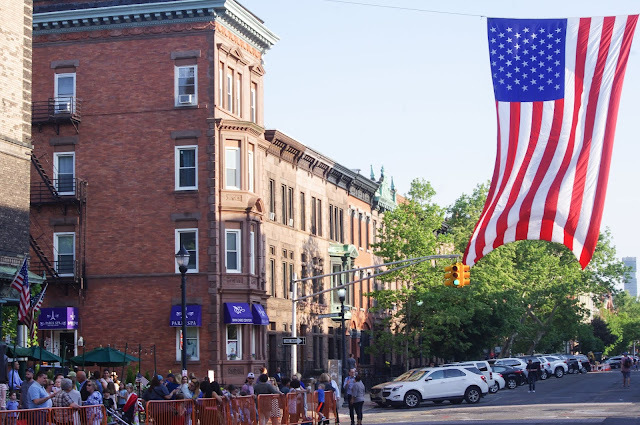 The Grand Marshal for this year's parade will be Michael DePalma, a decorated US Army Captain who served during Operation Iraqi Freedom, and who continues his service to all of us as a member of Hoboken's Police Department. It is going to be perfect, gorgeous summer evening so come join your neighbors for this great community event! As always, please feel free to email me or call me at 201/208-1674 if you have any questions of comments or want to discuss this or anything else. Hope to see you there! Talking Ed Note: Per MSV policy, local elected officials may see released here communications to the public without comment by the editor. The Mayor's Office recently excluded MSV from its releases thus eliminating themselves from the policy. Today (and/or tomorrow) may see major news break. For the conspiracy-fabricating loons at the Cave, let Horsey steer you from the utter vapidity as last when this signpost was highlighted. This is not about Hoboken news. It would be national news related to the collapsing #RussiaCollusionHoax. Since many "news" organization share this odd behavior attempting to "control the narrative," this Horse thought it would be useful to give a heads up. Is it a political statement of mere hyperbole or foreshadowing what will be (further) revealed? What does this forebode for the #RussiaCollusionHoax, its promoters and adherents? When is it proper to subvert and attempt to overturn an election if you don't like the election results? 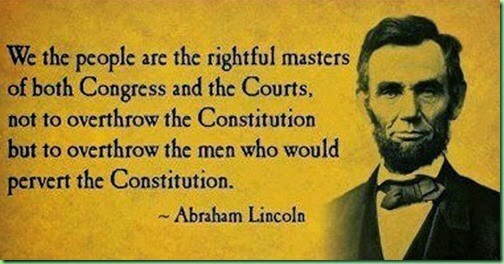 All you legal beagles out there, please point out that clause in the Constitution. Who was it that said it's a threat to Democracy not to accept election results? Is there an exclusion clause for the self-anointed "fourth branch" of government? On Thursday, Congressional leaders who have called the obstruction of their oversight role over the Department of Justice improper will be given time to review documents withheld to date. The collision of narratives and reality is coming to the fore. Meanwhile, Mark Penn, a former Clinton pollster, and Democrat, says "the deep state' is in a deep state of desperation" and points to the upcoming release of the DOJ Inspector General Michael Hororwitz and the issuance of part two of his report. Former US Attorney Andrew McCarthy examines the variously alleged originations of the #RussiaCollusionHoax and finds the attempts at retrograde justification more than a bit lacking. President Trump addressed questions from media before departing to a conference on Long Island for law enforcement and the MS-13 violence on "SpyGate" saying, "It looks like a very serious event. But we'll find out. When they look at the documents (DOJ, FBI), I think people are going to see a lot of bad things happened." "I'm mystified by the response from the media. I think it is undeniable that the president's early allegations have been validated to a large extent. I think you can acknowledge that without necessarily saying this was done for the wrong purpose," Turley said. "I also don't understand why there isn't more concern here. "The president was openly mocked for this allegation. People like Clapper said it simply wasn't true. I think that the media has to recognize this is a serious allegation," he continued. "All Americans regardless of their party should want to investigate this." CONNECTINGlTHElDOTS: HOPES – DIAPER DRIVE TODAY (5/19). Imagine if you or your friends could not afford diapers for your babies and young children. If you have the means, please consider donating diapers TODAY (of all ages) to assist the families of HOPES Early Childhood Program who struggle to make ends meet. You can drop them off tonight between 9pm-2am at Maggie’s Place, 87 Jefferson St., or at the following locations: HOPES CAP, 301 Garden St., or HOPES Family Resource Center, 532 Jackson St. If you want to order some diapers online and send, please do so to the Garden St. location. Even just one package helps. 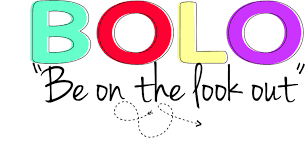 From the beginning, HOPES formally Hoboken Organization against Poverty and Economic Stress (H.O.P.E.S), was charged with the responsibility of combating poverty in Hudson County, New Jersey by providing a variety of social services for the community. Established in 1964, HOPES CAP Inc. is a Community Action Agency provides programs which respond to the social, educational, and training needs of the low income individuals in the community from newborns to seniors. In 1966, HOPES implemented one of the first established Head Start programs in the country. Public comments due 5/24 on their ACOE water permit application. On Wednesday night, the City Council voted unanimously to a resolution I sponsored along with Councilwoman Jen Giattino to submit a letter from the entire City Council to the Army Corps of Engineers requesting a public hearing (resolution and letter are attached). ACOE issued a public notice on 4/26 and the public comment period ends on 5/25. The process does not require a public hearing, but given the importance of this to our community we felt it was critical for as many voices to be heard on the issue as possible. The Mayor also submitted a request. Please take a minute to read the letter and submit your own. More voices are always better. Feel free to plagiarize any of the content in the letter. Alternative Site Analysis is being conducted for Hoboken by Boswell Engineering. Why are we doing this too if others have done this? 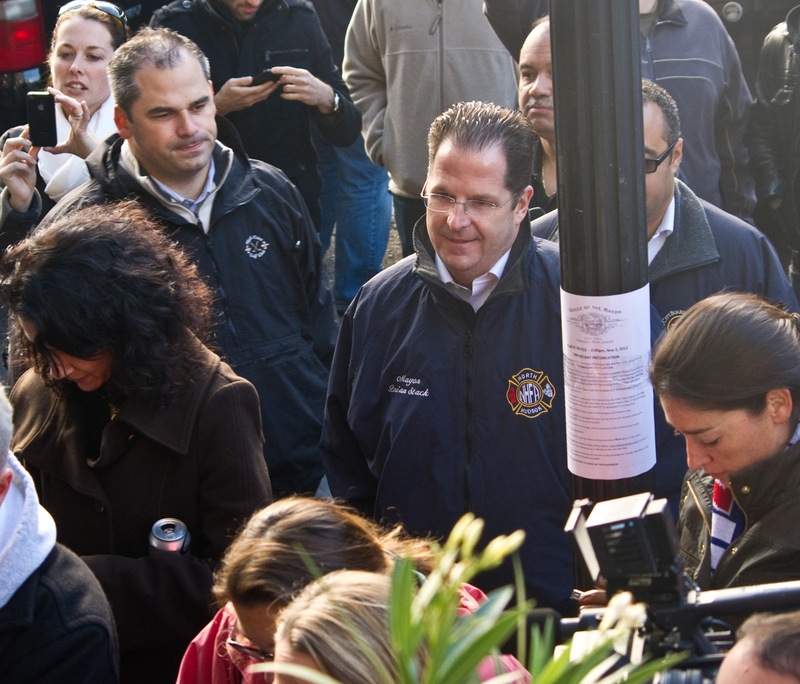 Because of potential bias in the results… Only Hoboken will be able to solve for Hoboken’s best interest. NYWW has supposedly conducted one that they have not made public and that excluded Bayonne as a potential site. NJ Transit is performing a second one (they conducted one in 2009 – see below), with a particular focus on Bayonne. 2009 NJ Transit Site Analysis Report not previously disclosed. Fund for Better Waterfront sourced this report through an OPRA request that reviews 9 sites from Weehawken to Bayonne and ranks the former UDD site 5th, with Hoboken’s own Lackawanna terminal as 1st. Interestingly, it identifies pressure from the City of Jersey City and the developer LeFrak as the main obstacle for Lackawanna. 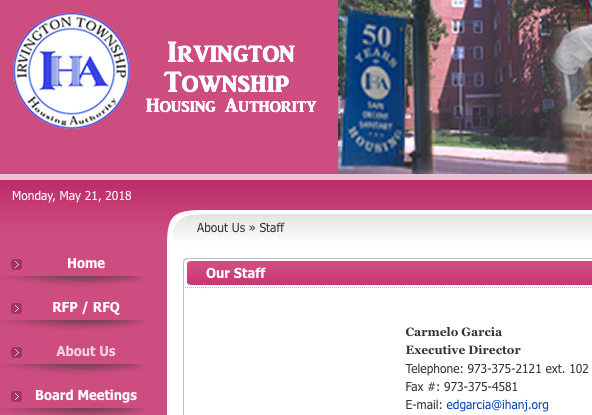 And we now know that the developers in Weehawken who bought their land from NYWW’s Arthur Imperatore are what is pushing NYWW out from their current site. And… NJ Transit and their development partners LCOR have both indicated to me that the land around Lackawanna is too valuable for ferry operations. Is it only me that thinks that private profit is being prioritized over public interest? I, and several of our neighbors attended the NJ Transit meet and greet last Monday at Lackawanna Terminal where top executives were there to speak with commuters. I spoke with Executive Director Kevin Corbett and other senior officials about the 126 Bus and in particular the long lines in the north. In a nutshell, they are constrained by PABT – specifically the evening rush hours. They cannot add any more buses given the staging requirements and lack of space. They will be looking at the numbers for Hoboken to see if reallocating buses within our own city may help balance out the waits – as they understand a lot of our population growth has happened in the north end. Another major constraint is that a significant number of bus drivers have retired and they are struggling to find replacements. If you are experiencing any recent improvement it probably has to do with some recent hires. But if you know of anyone who may be interested tell them to contact NJ Transit here. They told me with overtime, the role can pay as much as $65k / year with benefits. We also discussed adding a bus stop in the 1st ward at the corner of Newark and Willow which I have shared with 1st Councilman Mike DeFusco and the city. And finally, I encouraged them to provide further subsidies to NYWW – as they find an alternative site for them – so that they can reduce fares for Hoboken and make ferry riding a viable alternative to the buses. Right now the cost differential between the two does not make sense for many. In the subject, write "MESSY CABLES" and the ADDRESS. This will let us easily chronicle them. The missing stop sign at the intersection in front of Pier 13 has been restored by the county and the visibility has been improved. Thank you to Freeholder Romano for his assistance with this. Alas, the stanchions are back in full force in the second ward… installed without any prior warning. I met with several residents at the corner of 13th and Garden yesterday to discuss. At this corner, with vertical stanchions installed in the middle of the fire zones at 6 of the 8 corners, and a fire hydrant in one of the remaining two, there is virtually no place for any stops to be made. While standing there we witnessed a mail truck parked in front of the fire hydrant, a car parked for 30 minutes at the only other free corner while dropping off supplies, and a car has to stop in the middle of the block holding up traffic to unload heavy items. As I discussed with my neighbors, pedestrian safety (and idling Uber's) is what is driving the installation of these, as we witnessed dozens (plural) of cars not stop at the stop sign at that corner and a few vehicles park and extend into the crosswalk. I am not sure what the right solution, but it feels like all fingers point to better enforcement to make things work better in these areas. Please let me know your thoughts on the stanchions. My understanding is they are coming to more intersections near you…. A FEW OTHER UPCOMING AND NOTEWORTHY? May 19 & 20th, 2pm Hoboken High School’s production of the Willy Wonka and the Chocolate Factory. If you were not aware, Hoboken’s theatre department is award-winning and puts on professional level productions. There is limited seating left and tickets range between $5-10. This production is district-wide so the cast includes elementary through high school students. You can buy tickets here. May 21st , follow up meeting on Affordable Housing at the Multi Service Center at 7pm. Please join to help us find ways to solve how this nationwide crisis is affecting our own community. 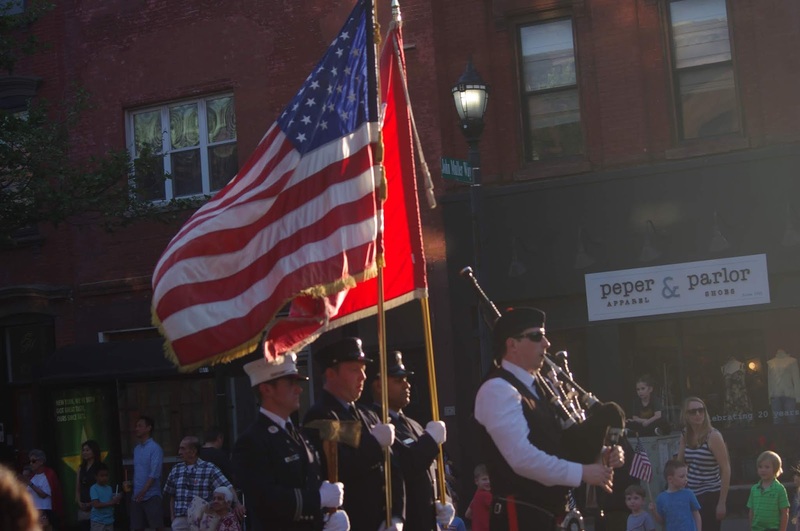 May 23rd, 630 pm, Hoboken’s 120th Memorial Day Parade. Read more here. Please join me and our Hoboken veterans to honor those who have sacrificed their lives for all of us.